It’s a big ocean out there. The Marine Corps’ push to return to its maritime roots and get more leathernecks out to sea on Navy ships means a brighter spotlight on some of those missions that haven’t routinely been done by units more attuned to the sandbox of combat. While the public might be more aware of operations to track and capture gun-toting hijackers and pirates or terrorists at sea, such visit-board-search-seize training (above photo) aren’t the only high-speed training Marines are getting to do. Just this month, after some training in San Diego, Calif., members of the 15th Marine Expeditionary Unit headed north to Ventura County to practice taking down gas and oil platforms off the coast of Carpinteria. The strategic and economic value of such energy-producing gas and oil platforms found around the world – from the Persian Gulf to the coast of Africa, South China Sea and off Australia’s northern shores – make them lucrative targets and places to hide for militants, terrorist groups and enemy forces. So protecting them becomes critical, and MEUs are among military units that are training for these missions. Such GOPLAT missions, as they are called, are among the variety of specialty operations that MEUs do, and by nature these raids assume an element of close-quarters combat. 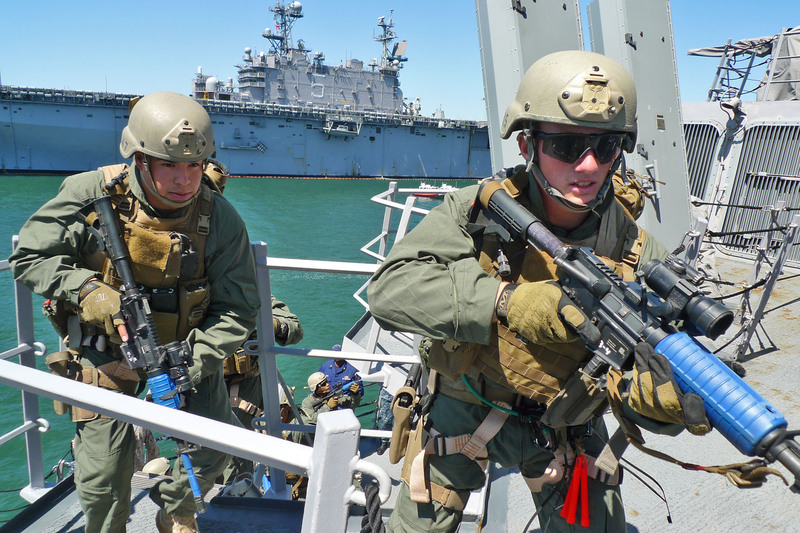 Much like VBSS missions, the maritime raid force can reach their targets by sea or by air, and much like the ships they assault, they encounter challenging confines in the shifting environment aboard the moored platforms at sea. These missions can become quite complex, and they rarely get much public attention or spotlight as stealth and covertness are usually key to success. Marines joined in GOPLAT missions back in the late 1980s during Operation Earnest Will, the mission that had warships escorting commercial vessels through the Persian Gulf to protect them against Iranian attacks. Some of these operations are noted in the book, No Higher Honor, written by Armed Forces Journal editor Bradley Peniston, and here by Marine Corps historian David Crist. Those operations, with names like Nimble Archer and Praying Mantis, the latter which involved Recon Marines and CH-46 and AH-1 helicopters, drew little attention, much like some GOPLAT operations after the invasion of Iraq. Elements of the MRF are drawn from Battalion Landing Team 3/5, which includes the combat-tested “Darkhorse” men of 3rd Battalion, 5th Marines. The 15th MEU, commanded by Col. Scott D. Campbell, includes the “Purple Foxes” of Marine Medium Helicopter Squadron 364 (Reinforced) and Combat Logistics Battalion 15. The MEU is slated to deploy later this year aboard amphibious assault ship Peleliu (pictured above), transport dock Green Bay and dock landing ship Rushmore.